Mumbai: At 10, Azmat Hussain is already a champ at signing autographs. One of the participants in Sa Re Ga Ma Pa Li’l Champs, a talent show on Zee, the flagship Hindi general entertainment channel (GEC) of Zee Entertainment Enterprises Ltd, Hussain, lives in Jaipur but is currently in Mumbai, clocking 12-hour shoots at the city’s Famous Studio and then five-six hours of singing practice at the bungalow in Goregaon (East) where he and his family have been put up by Zee. There are seven bungalows in all, and the youngest participant in the show is seven years old. The children and their parents have been living here while they compete in the show (yes, they’re out of school for now). Zee, whose ratings are being driven by the show, is lavishing attention on the young contestants. They get to eat their favourite food—biryani, noodles, pasta, pizzas—and wear good clothes. “Costume designers, make-up artists and cooks fuss over us," says Salman Ali, 13, who has travelled to Mumbai from Haryana’s Mewat district. It’s an alien world for most contestants who are used to much less back home. Hussain’s father is a small-time musician. It isn’t just Zee that is pulling out all stops for the stars of its talent show. The participants of Star Plus’ Just Dance, judged by Hrithik Roshan, have been put up by the channel at plush service apartments. Hospitality is the least of the channels’ expenses. Star Plus spends an estimated ₹ 4 crore on each episode of Just Dance. Sony, ₹ 2.5 crore on each episode of its reality show X-Factor, and Zee, a like amount on each episode of Sa Re Ga Ma Pa Li’l Champs. Sa Re Ga Ma proved a winner. It also gave Bollywood some of its current crop of singers: Shreya Ghoshal and Kunal Ganjawala. Even Sonu Niigaam, a then relatively unknown singer who hosted the show has become a star now. Singh, who left Zee in 2006 to start a production company, claims it was the success of Sa Re Ga Ma that prompted other channels to start their own music-based reality shows. Back when Sa Re Ga Ma was launched, talent shows were not critical to a channel’s success, soap operas (the weepier the better) were. With time, competition and declining peak ratings, talent and reality shows—many people club the two—caught the fancy of television executives, and audiences, though soaps still remain popular. The number of reality shows have gone up substantially in the last five years, according to L.V. Krishnan, chief executive, TAM Media Research, a company that tracks weekly ratings of television channels. From three to four shows in 2005, today Hindi general entertainment channels have, roughly, 30-35 reality shows, says Krishnan. From 1%, the genre’s share of viewership has increased to 8% in the last five years. “The genre share of reality shows on Hindi television channels is equivalent to the entire news genre," says Krishnan. According to him, they have also carved out a nice slot for themselves. “Reality shows typically occupy weekend prime-time slots and soaps, week day, prime-time (ones)". He admits that peak ratings of soaps have declined, from 10 TVR to 8. Reality shows do around 6, he adds. TVR or television viewer rating is defined as the percentage of viewers watching a programme at a particular time. Krishnan says that reality shows offer “definite audiences" which is why they are attractive for channels. “I’d agree that channels are betting big on reality shows because there’s a diversification taking place too. So there are food-, fashion- and action-based reality shows, not just music and dance formats." Such shows are the surest way to accumulate audiences for a specific period, he explains. With audiences, come advertisers, which is why channels don’t think twice about spending big money on reality and talent shows. Saahil Chhabria, the show’s director is giving instructions to Alankar Shankar who manages lights, even as three Jimmy Jib camera cranes sweep down. The cranes have been hired at an estimated ₹ 1 lakh a day. Sol Productions Pvt. Ltd, the company that produces Just Dance for Star spent ₹ 80 lakh on the set. The show’s auditions across 25 cities resulted in 500 hours of original content, which took three months to edit, said Fazila Allana, managing director of Sol Productions. The auditions added to the cost. For the show itself, Star India has booked 30 rooms for the contestants, and 8-10 dance studios for them to practice (the monthly rent for 30 rooms alone is around ₹ 50 lakh). 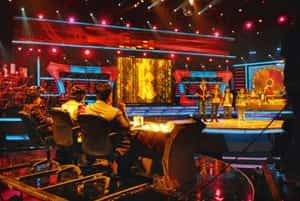 Then there are costs that “audiences can’t even imagine", says Jatinder Anand, the Zee executive in charge of hospitality for contestants on Sa Re Ga Ma Pa Li’l Champs. He rattles off how children, along with their parents, consume 70 litres of milk, 60 packets of bread, 80 litres of drinking water, and 20kg of rice every week at Zee’s bungalows. And a Feng-Shui expert “positively energizes" the Sa Re Ga Ma Pa Li’l Champs set before every show. Advertisers in India spend around ₹ 10,000 crore on TV ads and almost a third of this money goes to general entertainment channels such as Star Plus, Zee, SET, and Colors. The advertising will increase by 10%-15% in 2011, says Mona Jain, chief operating officer of VivaKi Exchange, the centralized buying agency for Publicis Groupe SA. If channels are willing to spend big money on reality shows, it’s because advertisers and sponsors are willing to pay a premium, says Ernst and Young’s Pherwani. He says it’s possible that Just Dance will “recover money in the first season itself", despite its “high cost of production". The show’s main sponsor, Maruti Suzuki India Ltd and Cadbury India Ltd have paid ₹ 9 crore while its 13 associate sponsors have paid ₹ 3.5 crore each. There’s no way reality shows can go wrong, says a TV executive. They develop a fan following and continuously attract newer audiences; they are also invariably backed by film stars, explains Raj Nayak, CEO of Colors, part of Viacom18 Media Pvt. Ltd. So, while Just Dance opened with a rating of 4.7 on a bouquet of Star channels, including Star Plus, Star One and Star Pravah, X Factor on SET opened with 2.4. In addition to sponsorship, the channels also sell spots; a 10-second one could cost anything between ₹ 3.5 lakh and ₹ 5 lakh. A rating of 6 and above is considered high. The popularity and economics of reality shows ensure that Indian television channels have more such shows than channels in Western markets; there’s easily a new show on every channel every quarter, says Alok Agrawal, chief operating officer, Cheil Worldwide Southwest Asia, a marketing and communications agency. Advertisers pay a premium because such shows ensure eyeballs and promise a greater return-on-investment than, say, soaps. “It’s a rich canvas for brand placements with anchors, judges, participants, everyone promoting brands on stage too," adds Agrawal. Participants love reality and talent shows because they come with the promise of big money and an opportunity to interact with celebrity judges. “The only reason why I’m here is because I’ll present my skills before Hrithik Roshan," says Just Dance contestant Karan Pangali, referring to the show’s lead judge, actor Roshan who is known for his dancing abilities. Audiences love the shows too. “The craving for 60 seconds of fame is intense because of the bombardment of these reality shows around us," says Dr Samir Parikh, chief, department of mental health and behavioural sciences, Max Healthcare. “It’s easier to relate to these shows because you feel as talented, real and convincing as the performer on the small screen. " Winners of reality shows have become TV anchors and actors, and popular singers and dancers. Some have even made it to Bollywood. There’s a good reason why careers in the television industry are “increasingly created through television", says Monika Shergill, senior creative director, programming, Star India. “Shows offer a viable platform but sustaining a career depends on sheer hard work and lots of willpower," says Abhijeet Sawant, winner of Indian Idol’s first season. Sawant, a middle-class boy from Mumbai, didn’t quite crack it as a Bollywood singer but earns well through a spate of live shows that also allows him to travel all over the world. And even those who do not win go back richer. “Forget the winner, most contestants who come on reality shows end up making lakhs through live shows and events," says Ajay Bhalwankar, the programming head of Zee Entertainment. That may explain why 3,000 children landed up for the Sa Re Ga Ma Pa Li’l Champs audition in New Delhi. Despite getting eliminated from the show few weeks ago, Hussain is back in Sa Re Ga Ma Pa Li’l Champs. Forget winning or losing, he’s a star already.